Hi All of you Kings and Queens of the court. 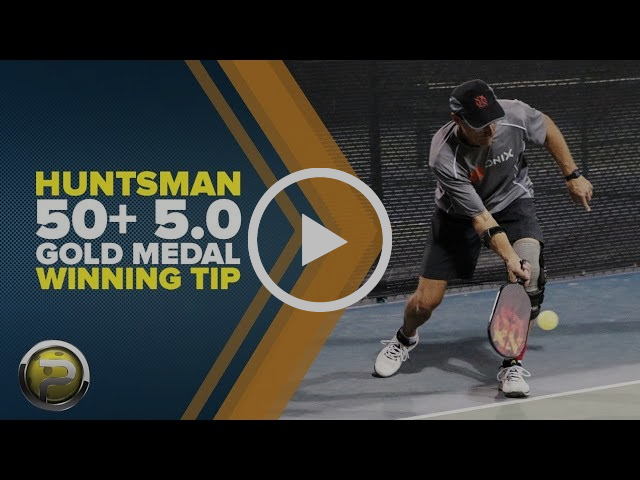 Do you want to work on your competitive Pickleball skills? 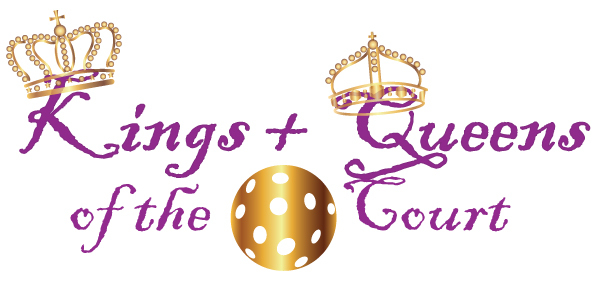 Kings and Queens of the Court is a competitive game that will take the place of our ladder league. It will offer you a competitive outlet without the need for scheduling. It will be held on Saturdays from 8:00am – 10:00am for advanced players (3.5 and above) and 10:00am – 12:00pm for intermediate & beginner players (below 3.5). Each time slot will be open for the first 24 players to sign up. If we have more than 48 players interested we can open up more time slots. Here is a simple description of how the game works: http://pacificnorthwestregionpickleball.org/category/playing-formats/. Don’t worry if it sounds confusing at first, I’ll explain it all on January 27. If you would like to join on Saturday, January 27, please send Darren Thompson an email at dgt74@yahoo.com with your skill level. Darren will decide each week what group you are in and what court you start on based on the people signed up. For Mirador Court members only. 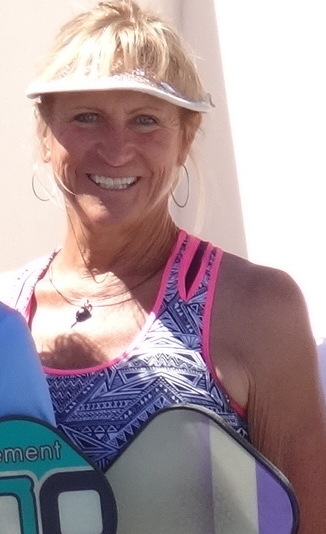 Intermediate / Advanced Drills with Deb are starting again this Wednesday, January 24 for Mirador Court members. Because it is a little cold and dark in the mornings, we’ll start at 7:30am and go until 8:15am. Open Play starts after that. Drills with Deb will be held on the following Wednesdays: January 24, January 31, and February 15. 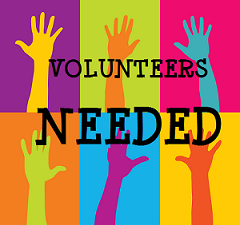 We are in need of Volunteers for the upcoming Sombrero Showdown and Amigos Cup tournament. There’ll be 148 players — 70 coming from San Carlos for the first time, so we want to put our best foot forward. If you have time to help, even for a few hours on one of the days, then WE NEED YOU! There are also some pre-tournament set-up duties that we need filled, so if you can help us before the event, please let us know. LINE JUDGES NEEDED: If you can see the white line, you can be a line judge! For the medal matches each day, we need line judges. Let us know if you are able to help. You’ll be provided with Line Judge training before the tournament. REFEREES NEEDED ON SATURDAY: We are still in need of referees, specifically on Saturday as this is the day that most of the volunteer refs are also playing. If you are not playing in the tournament and can help, we will train you on how to be a great referee. Kindly email Shelly at redheadhere@gmail.com or call 226-1207 or 622-116-7370 (cell) if you can help with any of the above. Thank you. If you can loan us any of these items, please contact Gail at northandsouthgail@gmail.com, 226-2105 or 622-150-1210 (cell). Thank you. For all players participating in the upcoming Sombrero Showdown and Amigos Cup who have not played in a tournament before, this orientation is for you! We’ll cover what you need to know so that when your name is called on Game Day, you’ll be ready to play. 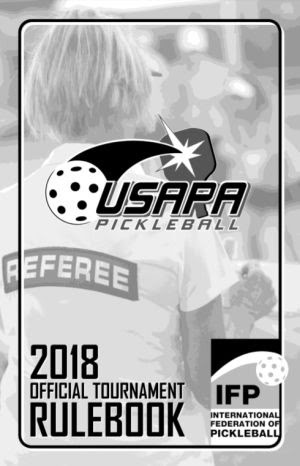 This includes the new USAPA rules (especially the 2018 changes), wristbands, warm-ups, court processes and etiquette, what referees are looking at, line judges, and more. 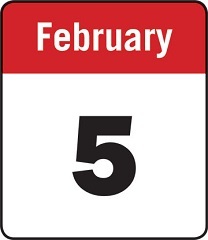 The orientation will be on Monday, February 5 at 10:30am at Mirador Courts. On January 31, 2018 changes to the USAPA \ IFP Official Tournament Rulebook will come into effect. You can find the full rule book on the USAPA website here and here’s a summary of the major changes. 4.A.2. The service motion begins with the server’s arm movement initiating the swing, backward or forward, to contact the ball. 4.A.9. If the serve clears the net or hits the net and then touches the receiver or the receiver’s partner, it is a point for the serving team. 4.B.9. Prior to the start of the service motion, to determine the correct receiver and his or her position, the receiving team may ask the referee to confirm the score. Players may not ask if they are in the correct position. 4.C.2. Once the score has been called, the receiver cannot become “not ready” unless there is a valid hinder. 4.E. The 10-Second Rule. Once the referee determines the receiver is in position and ready or should be in position and ready and the score has been called, the server is allowed 10 seconds to serve the ball. 4.E.1. If the server exceeds 10 seconds to serve, a fault will be declared. James Main, a 5.0 player from Colorado, is coming to San Carlos for the Sombrero Showdown tournament. After the tournament, he is offering a Skills and Drills Clinic for beginner and intermediate players. You’ll work on techniques and strategies to improve your level of play. 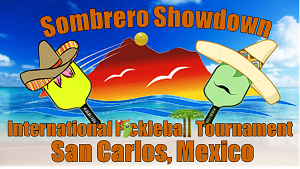 James competes in regional and National tournaments in the US and abroad, and also teaches pickleball and is the owner of Pickleball Vacation Adventures that takes people to exotic locations to learn and play. Click on flyer for more info. The clinic runs from 9:00am – noon, on Tuesday, February 13 and is limited to the first 16 players who sign up. You must be a Mirador Courts member to participate. The cost is $30 USD. 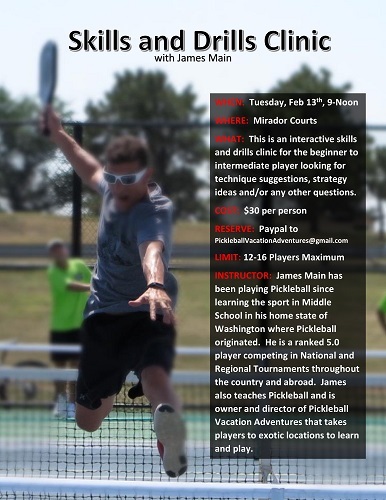 If you’d like to attend, please contact James at pickleballvacationadventures.com. 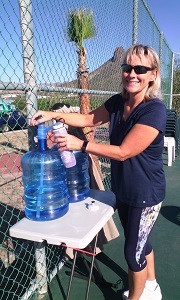 Another perk of playing at Mirador Courts … we now have water at the courts. Stay hydrated. The water delivery truck comes weekly to refill the 5 gallon jugs. If you see that a jug is empty, go into the shed. There is a plastic bag in a bin with replacement water stickers and tape. Take out a sticker and tape it to the empty jug. Place the empty jug at the end of the walkway outside of the courts. If you see that the jug has been replaced and is now full, kindly bring it back into the courts. It will be an effective and efficient process if we all manage it together. 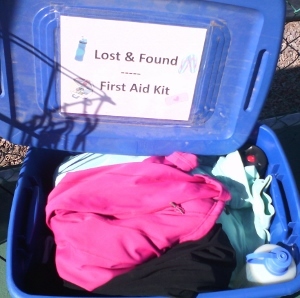 The Lost & Found box at the courts is full. Please check it if you’re missing clothing, a water bottle, etc. In general before you leave the courts each day, have a look around to make sure you have all that you brought. With the cooler weather in the mornings, we are usually wearing layers and inevitably, this is what is left behind….hoodies, jackets, etc. To all our members, and specifically for those who smoke or bring their dogs to the courts — we have recently landscaped the front and north side of Mirador Courts. Let’s keep all areas around the courts clean now. 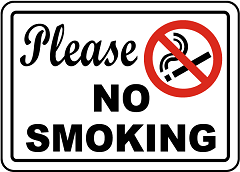 Please DO NOT smoke near the courts, and DO NOT leave your cigarette butts on the ground in this area anymore. If you must smoke, then kindly do it across the street and bring something to put your butts in and bring them home again with you. And also, as a courtesy to all members of this facility, pick up after your pets and discard of the trash. There is a green PASA bin at the far north-west side of the community complex where you can throw away dog poop. Thank you. 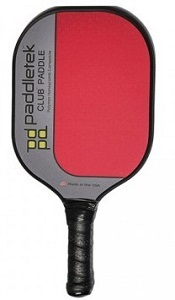 We have new Paddletek Club paddles for sale. This paddle is for people who are looking for a polymer core paddle at an entry-level price. The Paddletek Club is a medium weight paddle. It comes in 3 colors (red, blue, yellow). They are $50 USD (no tax, no shipping fees). If you would like to see or purchase a paddle, contact Becky Lupo at blupomx@gmail.com or call 226-1599. We have sold all the Franklin X balls. However Karen Stewart has DuroFast balls for sale at her Seaside Realty office. 3 balls for 100 pesos. You can contact Karen at stewmex@gmail.com or just come into the office to purchase them. Please bring exact change. 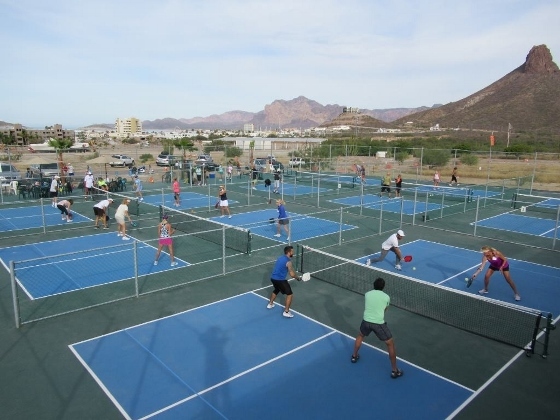 Mirador Courts — Let’s Play Pickleball! As of January 19, there are 163 Annual Members. That means that the courts are starting to get busy. 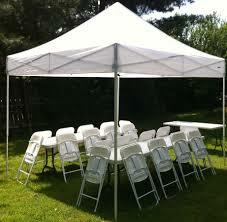 If you come on a day where there’s no open play, round robin, etc, make sure that you book a courtfirst. Please visit Hold My Court to book playing times. You can find instructions here.You can buy your Annual Membership at Seaside Realty for 1500 pesos for the year (expires on September 30, 2018). Click here for all the benefits included with your membership. And don’t forget to bring your membership card to Bonifacio’s restaurant AND now La Bartina 64 restaurant where you will receive a 10% discount on your food and drinks. Have a guest visiting and they want to play too? No problem – we have Day Passes available for 100 pesos per day, which can also be purchased at Seaside Realty. Open Play reserved times are booked for Mirador Court members to drop-in for social play. Open Play is scheduled Monday, Wednesday and Friday mornings from 6am to 11am. Note that during Open Play, Beginner and Low-Intermediate players will play on courts 4, 5, and 6. Advanced and High-Intermediate players will play on courts 1, 2, and 3. Please COME OFF the courts once your game is finished to allow the next set of 4 players to play. You’ll see new signage at the courts showing where to put your paddles as you wait for a court. Ladder Leagues: See the article at the top of this Pickleblast to read what is replacing the Ladder League. Sunday Round Robins: All Mirador Court members are invited to join us on Sundays at 8:00am for Round Robin play. We play for 12 minutes and then rotate players and courts. It’s a great way to meet and play with new people, without worrying about your scores. 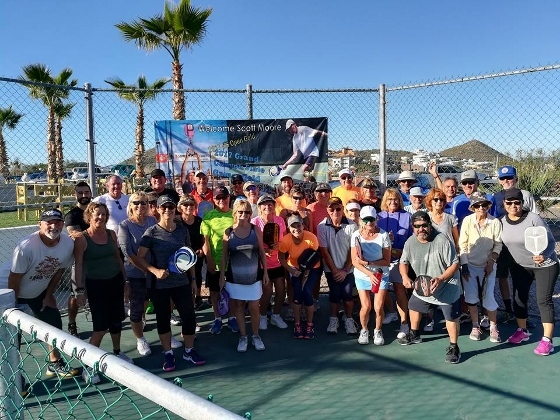 Visit the San Carlos Pickleball Association’s website to see all that we have planned for pickleball in San Carlos. 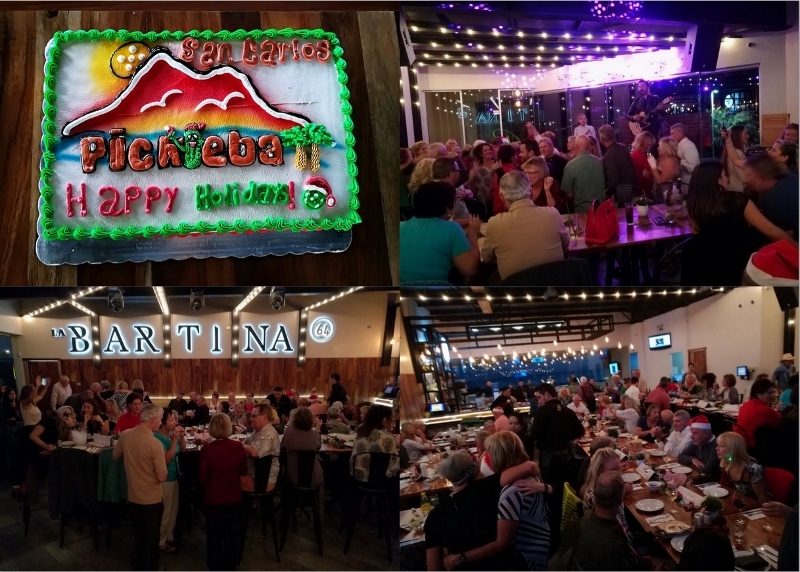 Over 80 pickleballers partied together at the Holiday Celebration at the new La Bartina 64 restaurant and bar. A HUGE Thank You to our Social Committee, Hillary, Tammi and Debbie for organizing a great event. Playing pickleball with visiting 5.0 pro Scott Moore and Susan Moore. Pat Murphy, Training Chair for the USAPA also joined them. It was a successful Boot Camp week for players here in San Carlos and for those participating from out of town. Learning a lot on the first day of pickleball boot camp with Scott Moore. It’s getting closer….from Thursday, February 8 to Monday, February 12, 2018, we will host the Sombrero Showdown and Amigos Cup Tournament (formerly the Dink ‘n Sea tournament). The tournament is now full. There are 148 players, and almost half are coming to San Carlos for the first time. It will be a great opportunity to play against new players, and also to showcase our beautiful town to those visiting. Soon participants will receive more information via email about the events scheduled throughout the tournament. Tyler Sheffield and Larry Moon offer a great tip on what to do when nerves make your play a little tight. Purchase your annual pass to play at Mirador Courts and join in on all the fun! Open Play, Scheduled Play, Clinics, Ladders, Tournaments, Social Events and more! Membership in the San Carlos Pickleball Association is free and open to all. Members of the Association receive a periodic newsletter with pickleball happenings in town. To join the San Carlos Pickleball Association email Christa at christa@whatsupsancarlos.com.